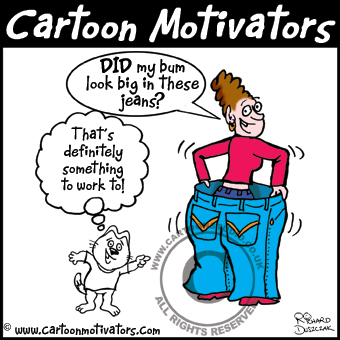 Cartoon on SLIMMING and some motivational quotes! Cartoon Motivator – Who Wants To Be A Millionaire? I quite like looking through an article that will make people think. Also, thanks for permitting me to comment! Richard Duszczak 35-years as a cartoonist, caricaturist and illustrator! Cartoon Studio Limited 29 Lake View Avenue, Walton, Chesterfield, Derbyshire, UK S40 3DR Tel: +44(0)1246 209034 Mob: +44(0)795 192 9836 mailto:rd@cartoonmotivators.com "Working to make you and your clients smile!" Pick TWO of the three options! When commissioning Corporate Cartoons you must choose only two out of the three options. Good+Fast = Expensive Choose this and I'll postpone every other project on my drawing board, my round of golf or give up my footy match ticket and work day and night to get your job done. It WILL NOT BE CHEAP though! Good+Cheap = Slow Choose good and cheap and I'll still do a great job at a discounted price. But you'll have to be patient while I fit you in after my higher paying clients, updating my web site, going down the gym, my footy matches, rounds of golf and liquid lunches! Fast+Cheap = Inferior Choose this option at your peril. It will still be delivered on time but it will be inferior, I'll cut as many corners as possible. You know the saying 'You get what you pay for!' The least favorable option in my opinion! © cartoonmotivators.com. All Rights Reserved.